Guangzhou, I find, is just like any booming city — busy, fast-paced, and teeming with people. Though I like the comforts of city living, I do enjoy discovering little pockets of tranquil space where you can relax, recharge, and get ready to delve back into the chaos. 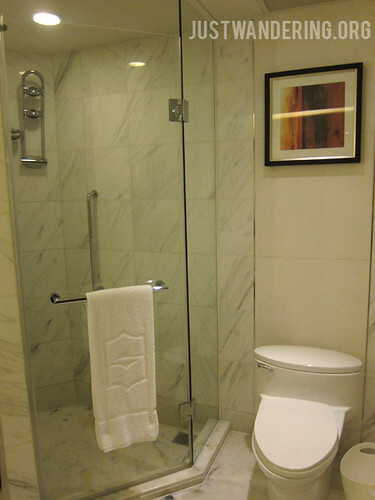 Shangri-La Hotel in Guangzhou is one of those places for me. It’s not in the middle of the bustling city — it’s far enough to feel like you’re away from everything, yet accessible via the subway and the hotel shuttle that takes you to key destinations around the city. My Shangri-La experience in Guangzhou started at the Guangzhou East Railway station, when I stopped by their desk right before exiting the station. I wasn’t exactly prepared for a trip to China, and the language barrier was something I wasn’t looking forward to. The staff behind the counter spoke good English, and when his record reflected that I’m supposed to be arriving with the later train, he quickly made a call to see if the car that’s picking me up is already on its way. 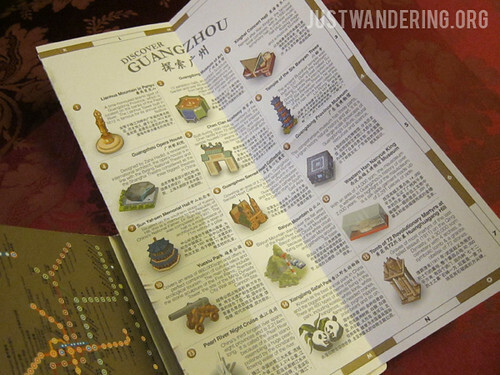 I love that they have a mini Guangzhou city guide for their guests! Luckily, the car was already in the parking area. He escorted me to the car, making small talk along the way. 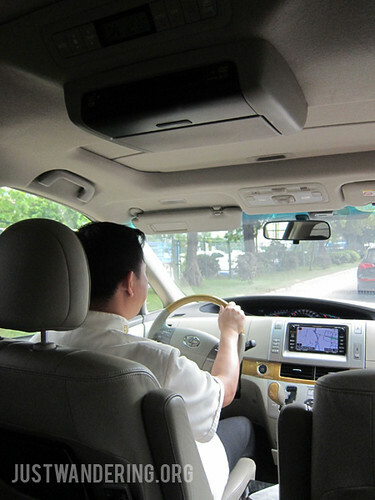 He introduced me to the driver, and wished me a pleasant stay in Guangzhou before closing the car door. The driver likewise greeted me, and offered me a cold towel and a bottle of water, both very much welcomed, as the heat and humidity was terrible. We chatted for a bit, before I got distracted with the things I was finding inside the car. There were magazines to read, even a DVD player, but what I really liked was the small Guangzhou city guide that has a map of Guangzhou, a list of all the sights to see, a metro map, and a small selection of helpful phrases in Chinese. We arrived at the hotel after a 30 minute drive. A doorman met us and helped me with my luggage, and was greeted with warm smiles at the reception. After checking my reservation, I was led to my room. I was wondering why they didn’t ask me to sign anything, and then I found out that I got another Horizon Club room, and I was to check in, right there in my room. Talk about convenient! No rainfall shower head here, but there’s a multi-directional duo shower head that is equally, if not, more awesome! Once again, I had a river view, but it was the huge swimming pool that caught my eye. I initially had plans to wander around Guangzhou after settling in, but upon seeing the pool, I knew that’s where I want to spend the afternoon. Before that, I had to met with Tina, Shangri-La Guangzhou’s Director of Communications for a tour around the hotel. One of the biggest properties in the chain, the hotel has a little over 700 rooms and suites. 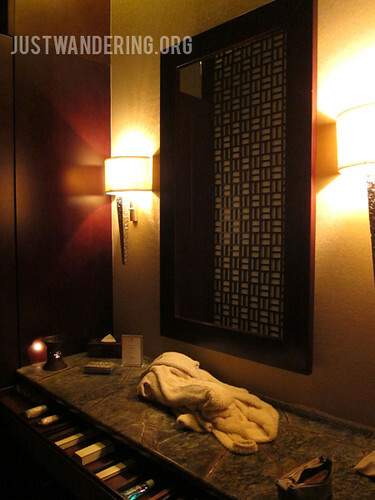 The clientele are a mix of business travelers and local leisure travelers. The hotel fills up during the Canton Fair, since the Guangzhou International Convention Centre is right next door. It also has huge ballrooms, one spanning over 2,000 square meters, perfect for those big wedding celebrations. 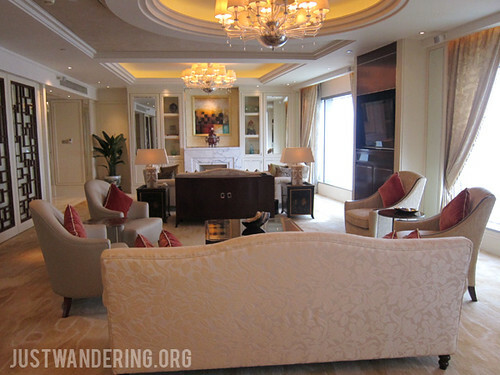 The Shangri-La Suite in Guangzhou offers a huge space for entertaining guests, an office area, a long table for meetings or formal dinners, a personal sauna, a walk-in closet, and best of all, a view of Guangzhou, the Pearl River and the Canton Tower right from the bathtub. 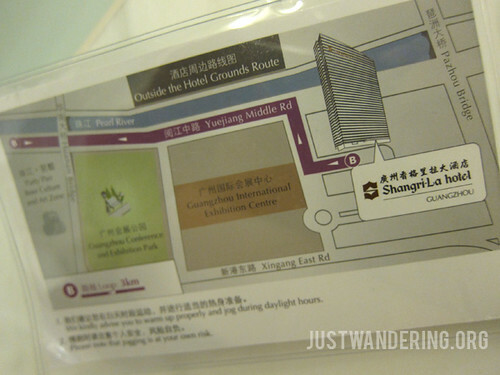 Hanging from the coat hook inside the bathroom is this lanyard with a jogging path map if you want to run or walk within the hotel grounds or by the Pearl River. It’s a lovely touch, I’d say. After the tour, I hurried back to my room to change into my swimsuit. Since it was a weekday, only a handful of people were swimming. There were plenty of lounge chairs, each one under the shade of an umbrella so you don’t burn to a crisp. One area of the pool was less than a meter deep, which is great for guests traveling with kids. Yup, Wednesdays should be spent like this. As I relax in the pool, I the sunshine and the relative quiet. The hotel has a sprawling garden, so when you’re in the pool, it’s as if everything outside is so far away. 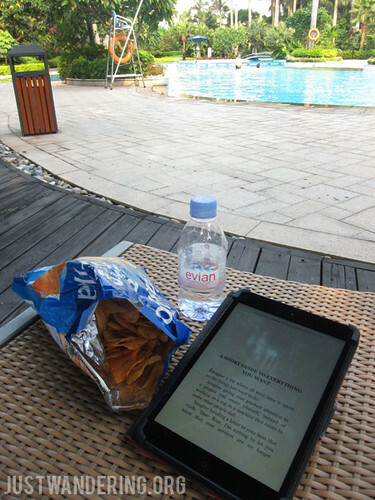 Afterwards I lay back on my lounge chair, reading an e-book while munching on chips, wishing that every Wednesday can be spent like this. 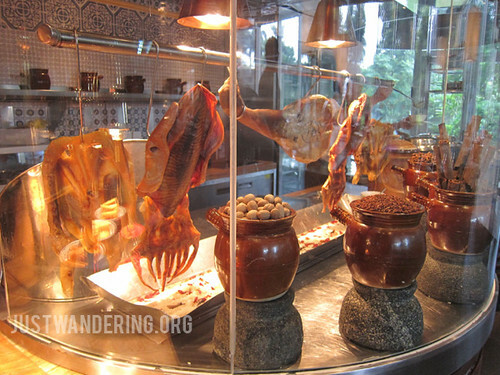 Nothing like a display of dried and roasted seafood to wake you up in the morning. Though I had access to the Horizon Club Lounge, I opted to have my breakfast at the Wok Too Café. I was greeted with a wide array of breakfast choices, from breads, to dimsum, congee, cereals, and juices. 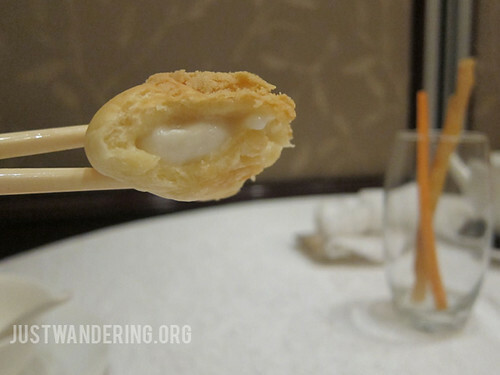 I made a beeline for the dimsum; even after dinner at a local restaurant the night before, and a lunch at the Summer Palace afterwards, I can’t seem to tire of it. 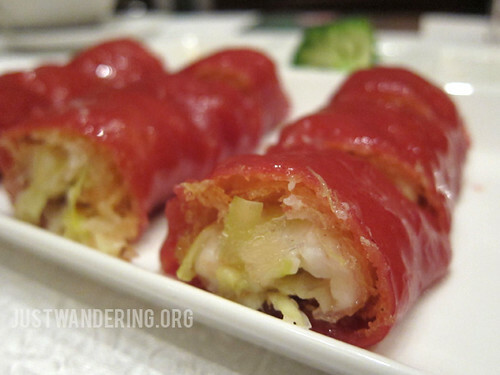 This is, after all, Canton, and where else to best eat Cantonese food than here? Mood lighting, check. Soothing spa music, check. Fluffiest bathrobe in the world, check. I was to head back to Hong Kong that afternoon, so Tina had arranged for me to have a massage at the Chi Spa, to keep me energized for the long trip back home. The massage started with some Wushu stretches, which worked fun to learn and easy to do. The massage that followed was equally amazing, as I ended up dozing off halfway through. Steamed rice paper with another layer of crispy fried rice paper and veggies. YUM. Love the flavors and textures. Just before I checked out, I met once more with Tina for lunch. The lunch crowd was just thinning out, but there were still a number of groups digging into their food when we walked in at 12:30 pm. I left it up to Tina to order, since I was in the mood to try new things. The first to arrive wasn’t anything new, but it was certainly very much welcomed still: har gao. Shrimp dumpling that was so juicy and bursting with flavor. Lunch was off to a great start. It was followed by pan fried pork buns, rice paper rolls, baked almond buns, sweet potato tops, and steamed milk custard. They were not things that I would order, so I was glad to get this opportunity to discover new dishes to try. I thought this was a baked pork bun, but was pleasantly surprised to taste almond. A great palate cleanser. After a very good lunch, I headed back to my room to finish packing my things. I look around my room for a last sweep to see if I left anything behind, and it left me smiling, thinking about the days I spent with Shangri-La. 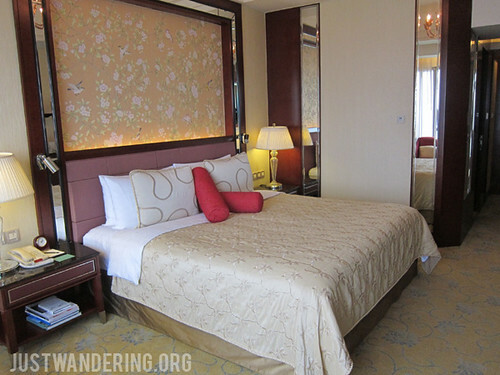 Though my time at Shangri-La Guangzhou was short, it was no less sweet. Once again, a huge thank you go out to Shangri-La Hotels, specially to Tina and Bonnie, who made this possible. 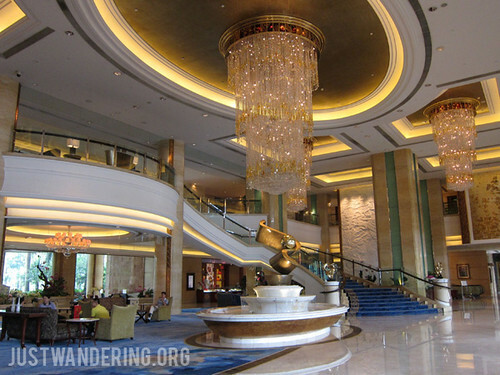 Want to see all the photos from Shangri-La Guangzhou? View them at the Just Wandering Facebook Page.